Land of Mine is one of those films that you may only be able to watch once, not because of its quality, but because of its content. 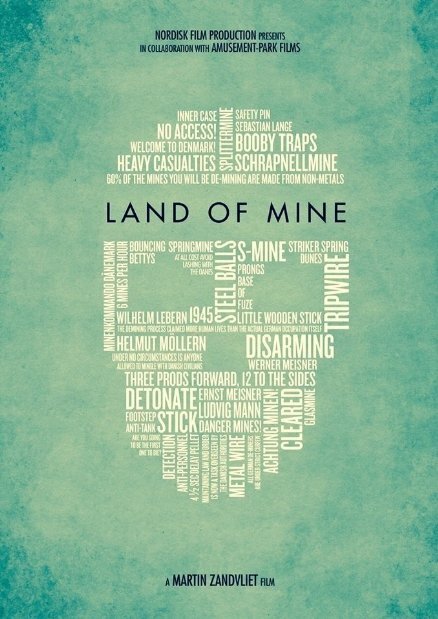 Land of Mine is a Danish/German film that tells the based-on-facts true story of a group of young German POW’s that are forced to dig up and defuse their own landmines that they had planted along the west coast of Denmark during the second World War. Land of Mine brings forward a new piece of history from World War II that isn’t very well known to most people which is hard to do considering many World War II stories have already been told in cinema. Land of Mine is tense and fast-paced and keeps you on the edge of your seat the entire time. It is unpredictable and you never know what is about to happen which created some very shocking moments. The acting on all parts in this film was phenomenal. Roland Møller was extremely convincing as Sgt. Carl Rasmussen, a seemingly cold hearted soldier who was left feeling hatred towards the Germans after the War had ended. Møller was accompanied by a great cast of young actors who were equally as phenomenal. They make you feel an extreme sense of pity for them and you pray that everything will work out in the end, no matter how unrealistic that seems. Louis Hoffman stood out as a smart and exceptional leader in his portrayal of Sebastian. Another beautiful performance was that of twins Emil and Oskar Buschow as their brotherly bond was very evident throughout the film which caused for some pretty emotional and heartbreaking scenes. 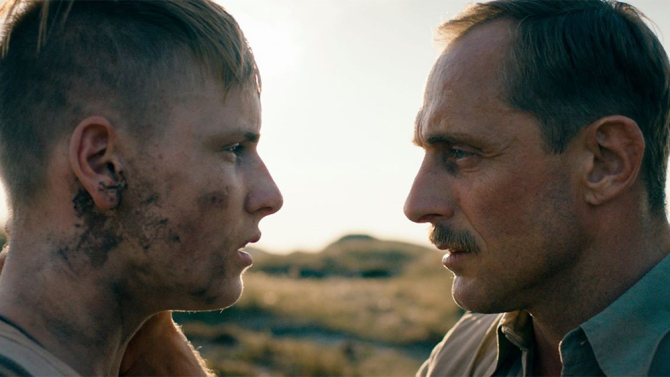 Although Land of Mine had its fair share of graphic imagery and intense scenes, it was also filled with beautiful cinematography which served as a great juxtaposition of the terrible things that were happening in such a beautiful country. The musical score was also very haunting and added to the nerve-wracking moments throughout the film. Land of Mine was a fantastic film to see right off the bat at the Toronto International Film Festival. It was bold and shocking and teaches you a part of history that isn’t considered common knowledge. Although it was tough to watch, it definitely makes you think about it and its content long after you’ve finished watching. Haven’t heard of this one. Sounds interesting. Nowadays, the most startling and unnerving movies for me are war films like this. And thanks for following our blog! It is definitely worth a watch! No problem! Thank you for following me as well! Looking forward to more reviews from TIFF! This sounds wonderful. I definitely need to check this out because I am very interested in anything to do with ww2! Glad you’re seeing some good stuff!! Pingback: My TIFF 2015 Experience | big city bookworm. Pingback: All The Light We Cannot See (Book Review) – Big City Bookworm.